Can you be body positive and encourage dieting? Some people are missing the point of body positivity, so let’s set the record straight. Example #1: “Selling fat loss as health.” People have been trained to be afraid of fat – but it’s time to be aware of how fatphobia is being sold to you for profit. “Why are we so attached to our diets?” Diet culture is everywhere, spreading misinformation about what “healthy” means. But we must break free from diet culture’s influence – and here’s what’s in the way. We’re body-positive, but when it comes to our own bodies, it’s hard to shake off society’s body-shaming messages. Can you relate? These strategies can help you stay positive through your own body’s changes. This author’s done with FitBit, Nike+, and all the other apps that “track your numbers.” Here’s why this is a big problem disguised as health – and how it might be taking a toll on you. 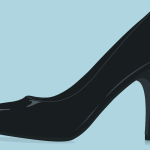 Why do so many (including this author) love heels, in spite of their problems? These answers are fascinating. Do you have any to add? The “Dad Bod” hype is everywhere right now. Here’s all you really need to know about the sinister, body-policing tone of this sexist trend. You might think you’re being helpful when you comment on other people’s bodies, but that couldn’t be further from the truth. Can you spot what’s off about ads like Dove’s #choosebeautiful campaign? What do you picture when you think of health, fitness, and nutrition? Many of us envision a thin person because we’re socialized to visualize these things through a skewed lens. Here’s what we need to do to actually make healthy choices possible – and why we really need to stop fat-shaming and start taking on the systems exploiting and oppressing us all.